In March 1902, Army Order 67 abolished the Army Nursing Service (ANS) which consisted of 88 lady nurses, supplemented by an Army Nursing Service Reserve. The ANS was replaced by the Queen Alexandra's Imperial Military Nursing Service (QAIMNS). A Matron-in-Chief administered the new organisation. Miss E H Becher held the post of Matron-in-Chief from April 1910 to August 1919. The QAIMNS reserved the right to appoint all nurses in peace and war to military hospitals. In the event of war, however, qualified nurses of the Army Nursing Service Reserve were given priority. 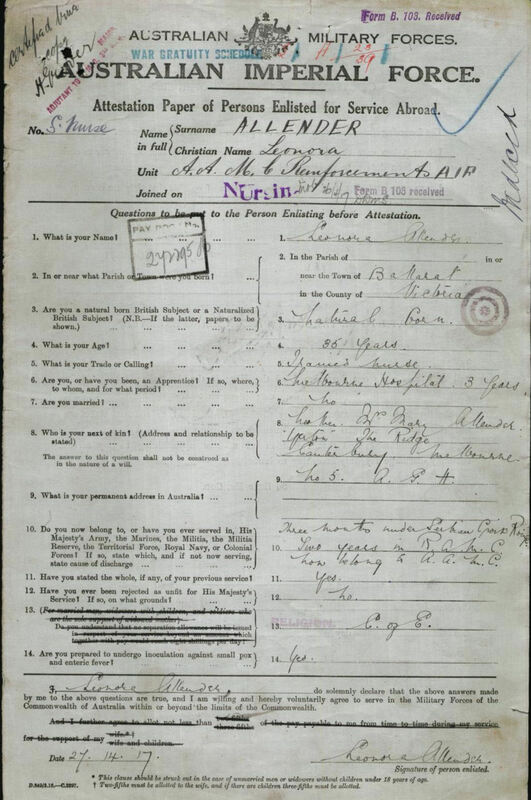 The Army Nursing Service Reserve (ANSR), which was recognised by Army Order dated March 1897, came under the direct control of the War Office; it had no official connection with the QAIMNS. The ANSR was employed in military hospitals at home and abroad. In 1910 the QAIMNS Reserve took over this role from the AMSR. The 23 Territorial Force General Hospitals had their own nursing service, the Territorial Force Nursing Service, (TFNS); the service had its own Matron-in-Chief. At the beginning of August 1914, the QAIMNS had a strength of 290 on the active list, and 173 in the reserves. In March 1919, the Sisters and Staff Nurses of the QAIMNS and the QAIMNSR were demobilised at forty-eight hours' notice, when their pay and allowances were terminated. On ceasing the service, sisters were paid a gratuity of £10 for every complete year of service; Staff Nurses received £7 10 shillings. The Australian Army Nursing Services (AANS) was the nursing service for the Australian Imperial Force (AIF). The AANS only accepted professional trained nurses. Nurse training was hospital based and ran for three years. At the end of the time the nurse probationer had to pass both her hospital examination and the examination of the relevant nursing association to consider herself a graduate. In 1914, the Commonwealth of Australia had two nursing associations: the Victorian Trained Nurses' Association, based in Victoria, and the Australasian Trained Nurses' Association based in Sydney. On graduation, most nurses did not work in hospitals but went into private nursing. They lived in nurses' home, and hired themselves out to nurse patients in private homes. Others opened and ran their own private hospitals. Sister Allender Leonora Millicent QAIMNSR, was born on 9 June 1882 at Victoria, Australia. She was educated at Queens College Ballarat, and matriculated from the University of Melbourne. She commenced her nurse training in 1902 at Melbourne General Hospital (1902-05) (now the Royal Melbourne Hospital), where she held a position as Staff Sister from 1909 to 1919. 1902–Dec 1905 Student Nurse Melbourne General Hospital. Dec 1905–1906 Student Nurse Melbourne General Hospital. 1909–Dec 1911 Further nurse training at Melbourne General Hospital. Had special certificate in infectious diseases under Royal Victorian Trained Nurses' Association (RVTNA). 1909 Theatre Sister and Staff Sister at Melbourne General Hospital. 1911 Acting Matron Crook Hospital. 1912 Theatre and Gynae Sister Women's Hospital Melbourne. 1912—1914 Ran own private Nursing Home in Melbourne. 1914—1915 Typhus nursing with the Serbian Relief Hospital Serbian Red Cross for 3 months. Before April 1915 Served under Miss Ethel Gray Matron Australian Imperial Force Convalescent Depot Harefield Park Uxbridge London. 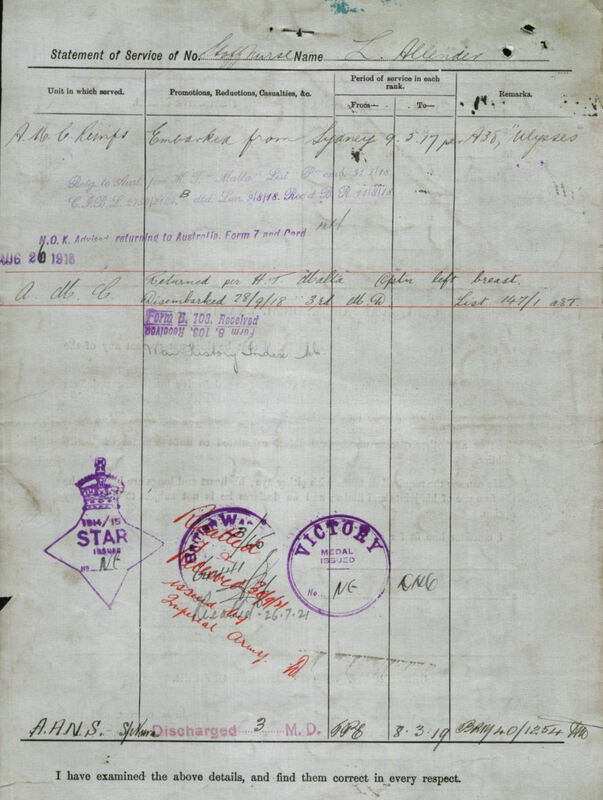 10 May 1915 Applied for a commission in QAIMNSR. 15 May 1915 Left England. Posted to St Andrews' War Hospital Malta. Also served in hospital transports during the Gallipoli Campaign. 5 Oct 1915—8 Apr 1916 Testimonial from Acting Matron E Macfarlane TFNS to Major J C G Carmichael o/ic St Andrew's dated 8 April 1916: Miss Leonora Allender has worked at St Andrews' Hospital from 5 October 1915 to 8 April 1916. She is a very good nurse and has performed her duties satisfactorily, and conduct good . 4 April 1916 Application to E Macfarlane TFNS, Acting Matron St Andrew's Hospital Malta, to resign from QAIMNSR on 16 May 1916 on completion of her contract. 13 July 1916 Renewed her contract for a further six months. Her signature was witnessed by Matron in Chief Miss E H Becher. 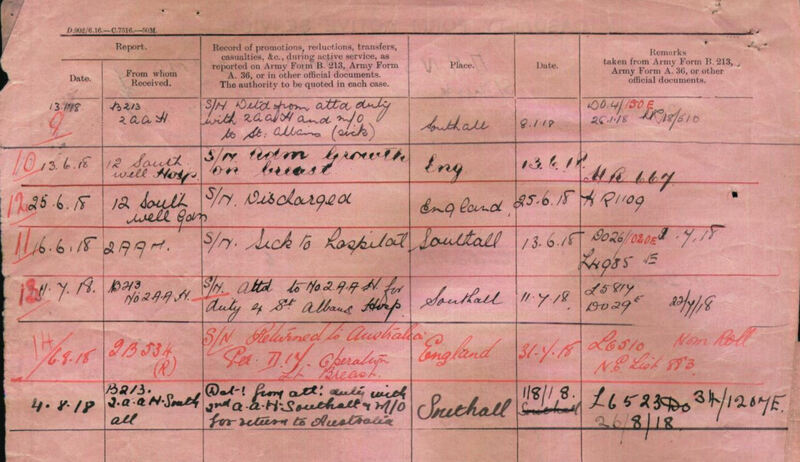 On 15 July 1916 Sister Allender was posted to the War Hospital Guildford. 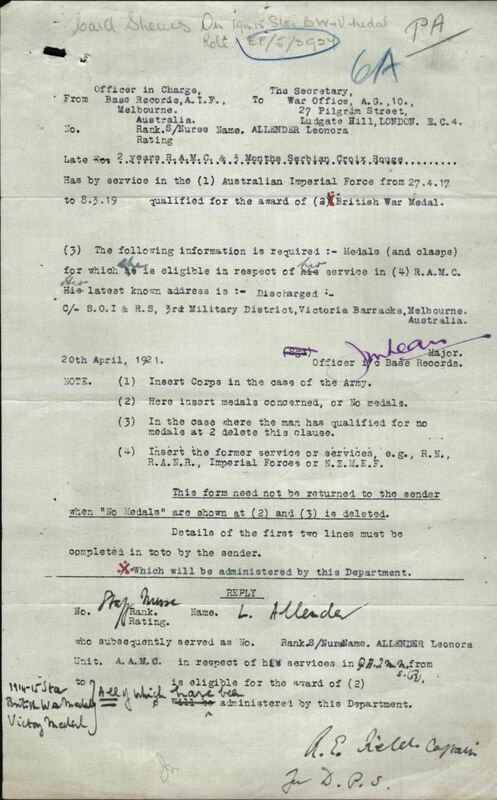 3 Nov 1916 Applied to resign from QAIMNSR to return to Australia. Her resignation from QAIMNS was accepted by HQ Eastern Command on 4 November 1916. 11 Nov 1916 Ceased working at the Guildford War Hospital on 11 Nov 1916. 16 Nov 1916 Application for a gratuity to HQ Eastern Command, completed by Matron Guildford War Hospital A H Withers, was rejected by HQ Eastern Command. Sister Allender was not entitled to any further gratuity for the period of five months, since her contract for six months had not been completed. 3 Mar 1917 While serving at the Guildford War Hospital, was brought to the notice of the Secretary of State for War for valuable service rendered in connection with the war. 22 Apr 1917 Enlisted as Staff Nurse AANS AMC Reinforcements AIF. 9 May 1917 Embarked at Sydney on the Ulysses. 11 Aug 1917 Detached for duty with Croydon War Hospital. 7 Oct 1917 Detached from Croydon War Hospital for duty with 1st Australian Auxiliary Hospital Harefield Park House. 30 Nov 1917 Detached from 1st Australian Auxiliary Hospital for duty with 2nd Australian Auxiliary Hospital St Marylebone School Southall. The hospital accepted patients from No 1 Australian Auxiliary Hospital Harefied Park. 8 Jan 1918 Detached from 2nd Australian Auxiliary Hospital. Admitted sick to the Convalescent Home for Australian Nurses St Albans. 13 June–25 June 1918 Admitted to 12 Southwell Gardens Hospital South Kensington, for investigations of a growth on her left breast. 26 Aug 1918 Returned to Australia for breast surgery on HT Malta. Disembarked on 28 September. 2 June 1920 Applied to the War Office for her 1914-15 medal known in Australia as the Gallipoli Star. I was informed by Military HQ Melbourne that although I did hospital transport work up to the Peninsula during the Gallipoli Campaign the medal could not be awarded by the Australian authorities as I was serving with the Imperial Army at the time. I left England in May 1915 and did 12 months service in Malta and on hospital transport as a sister in the QAIMNSR . TNA:WO 399/90, Nursing Service Records, First World War 1 January 1914 - 31 December 1920 Leonora Allender QAIMNSR. Nurses Mentioned. Times [London, England] 5 March. 1917: 6. The Times Digital Archive. Australian War Memorial Person Search. 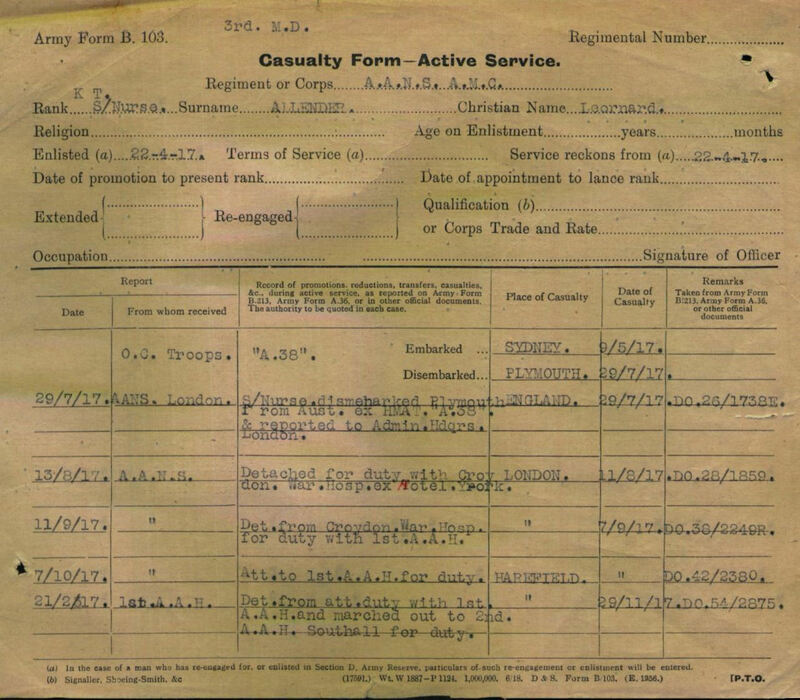 National Archives of Australia Military Service Records. National Archives of Australia Records search. National Archives of Australia 1916 Australians in France. Ministry of Pensions. Location of hospitals and Casualty Clearing Stations in the Great War. TNA:WO 95/3989, War Diary Matron-in- Chief British Expeditionary Force France and Flanders.